Many patients want to discuss Invisalign as an alternative to metal braces. They love the idea of using a nearly invisible treatment appliance instead of conventional braces. 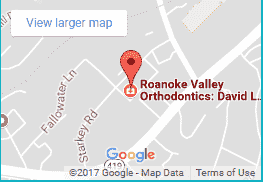 If you’ve been considering orthodontic treatment for yourself or your child, the very best way to determine which treatment will work best is to schedule a free consultation at one of our three locations in Roanoke and Rocky Mount. Here are some points to consider about treatment with Invisalign versus metal or ceramic (clear) braces. How do metal and clear braces work? We fit high-quality stainless steel or ceramic braces on each tooth. The arch wires we place apply steady, gentle pressure on the brackets to slowly and gradually move the teeth into a straighter and healthier position. We use small colored or clear rubber bands to tie the wires into the braces and you can choose whatever color you want! We enjoy seeing our patients for adjustments about every 7-8 weeks. At these appointments, we are simply adjusting the wires and rubberbands or placing a new one. We no longer “tighten” your braces and nothing ever hurts at your appointments! Braces are appropriate for patients of all ages, starting at about 7 years old. Treatment times vary depending on a variety of factors, but for most patients, treatment lasts 18-24 months. Braces work for a wide range of orthodontics problems and are especially effective with the most complicated cases that won’t respond as well to other treatments. Braces are very durable. If you follow our care and hygiene instructions, braces are difficult to break. The braces we use are much smaller, more comfortable and more attractive than older styles of braces. We also rarely use bands that wrap around the entire tooth. You’ll have to avoid certain foods during treatment to minimize the likelihood of loose brackets and bent wires. Dental hygiene can sometimes be more challenging and sometimes a bracket can come loose or a wire may pop out of place. We give you all the supplies you’ll need for proper oral hygiene and for comfort during treatment. An impressionless, radiation-free scan of your teeth is performed with our iTero scanner. 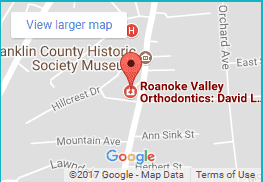 Then Dr. Jones uses 3-D computer imaging to create a customized prescription series of custom-made aligners that gradually and gently shift your teeth into place. Invisalign aligners are worn over the teeth like a mouthguard but much thinner. They are made from clear BPA-free plastic, making them comfortable, safe, and virtually invisible. Aligners are generally replaced every 10-14 days and you’ll visit our office every 8-10 weeks so we can check your progress. The My Invisalign app can be used for notifications and to help track your treatment. Treatment with Invisalign is appropriate for teens and adults. Just like braces, treatment times vary. Depending on the severity of bite, patients wear aligners from 6-24 months. Invisalign aligners are virtually invisible. Most people will never know you’re wearing them. The aligners are smooth, eliminating irritation to your cheeks and gums. You can remove the aligners. This makes it easier to brush and floss during treatment and eliminates the need for food restrictions. Invisalign is not appropriate for severe orthodontics cases. Metal braces are better for extreme malocclusions. Consistency and compliance are mandatory for Invisalign to work effectively. The cost of any orthodontic treatment depends primarily on your individual needs and the complexity of your case. We work with your insurance coverage and your FSA or HSA funds to maximize your savings. We offer a variety of payment arrangements and will file your insurance on your behalf to maximize your benefits. We’ll compare costs and review all financial details with you before you start treatment. 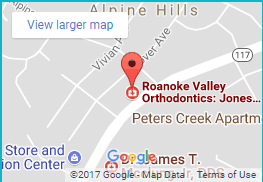 To discuss braces, Invisalign, or other treatment options, contact us to request your complimentary consultation at any of our three locations. Please call 540-563-1640 or use our appointment request form. For more information about starting treatment, visit the New Patients section of our website.